Watch the RecordPrpduction Interview with George Shilling Here! History: The son of famous pop singer Sue Thompson and musician / songwriter / producer Hank Penny, Greg was raised in an artistic atmosphere in Hollywood, California. He got his first exposure to recording studios while attending his parents sessions in Nashville and Los Angeles. Its not unusual that his dreams were about creating pop music. Growing up as he did, in Las Vegas, Nevada was surreal indeed...however, it gave Greg the dreamtime to explore the wonders of record production in his humble 4 track recording studio / laboratory. He dreamed that maybe someday, he would make records like his idol, Beatles producer George Martin. Fast forward to the present and we find Greg's dreams did come true. He not only grew up to produce successful pop records, but produced for and became close friends with, many of his childhood idols. Sir George Martin being one of them. Greg's early production successes led him to work with one of the greatest living vocalists: k.d. lang. The results of this collaboration were the albums: “Absolute Torch and Twang” and “Ingenue”. Both were giant sellers, Grammy winners, and defined k.d. as an artiste without boundaries. Greg's achievements with k.d. lang brought him to the attention of someone who was already a friend, Elton John. Greg and Elton had met when they were 15 and 24 respectively and though Elton was already a megastar, he encouraged Greg to follow his dreams. It was only fitting that the first recording that Elton asked Greg to produce would be a duet with k.d. lang. "Teardrops" from Elton's "Duets" LP became a favorite of fans of both artists. On this session Greg worked with another one of his idols, Producer / Arranger Arif Mardin. Who wrote the string arrangement for "Teardrops". The sessions for "Teardrops" went so well, Elton asked Greg to continue work on "Duets" and...to produce his next studio LP "Made In England". This was where Greg's dreams really did come true. 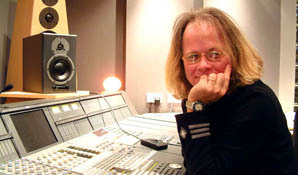 Producing his hero and friend, Elton John, collaborating with Bernie Taupin, recording Elton's fantastic band, watching the genius of arranger Paul Buckmaster, working at AIR Studios in London, and finally meeting and working with his idol, Sir George Martin who wrote the string and horn arrangement for the song "Latitudes". "Made In England" was both an artistic and commercial success. 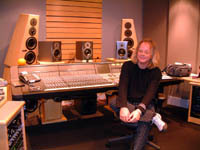 Greg has also produced albums by: Martini Ranch, Marc Anthony Thompson (Chocolate Genius), Nathalie Archangel, Maura O’connell, Sun 60, Marc Jordan, Eddi Reader, Cher, Ryan Downe, and Paul Young (see discography) in addition to engineering and mixing two albums by Rickie Lee Jones. Her album “Flying Cowboys” gave Greg the opportunity to work with yet another one of his heroes, Walter Becker of Steely Dan. His band Poperetta is the result of fooling around in the studio, which is one of Greg's favorite things to do. Poking at ,and playing with, various instruments and gadgets until it all takes the shape of a record. Not a bad dream at all. Current Credits: Recently Penny was mid 5.1 remixing some of Elton John's vast catalogue at Sphere Studios, London. He is currently the president of Flower Records, producing records by Twin Trip and Poperetta. Greg is founding member of Tokyo Project13, an anime TV series surrounding fictitious good/evil characters with rich musical content.